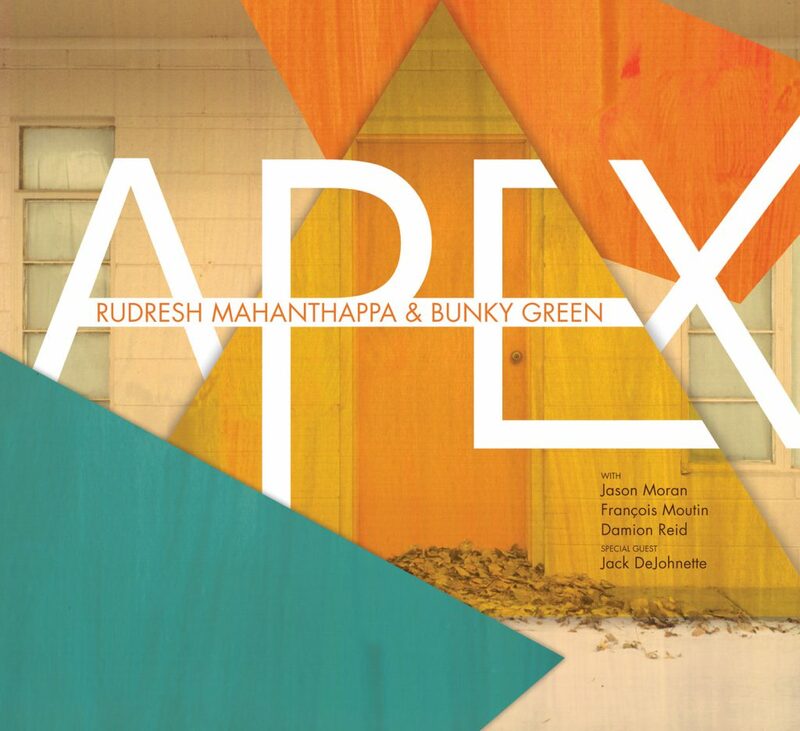 Apex is a blazing collaboration between alto saxophonists Rudresh Mahanthappa and Bunky Green that puts on display a fifty-year continuum of state-of-the-art saxophone playing. Featuring the all-star band of Jason Moran on piano, François Moutin on bass and switching off on drums, the dynamic Damion Reid and the legendary Jack DeJohnette, Apex shines a much-deserved spotlight on Bunky Green, a hugely influential but under-recognized original in jazz. As Mahanthappa tells it, “I first heard about Bunky from the late great saxophone teacher Joe Viola when I was a student at Berklee in the early 90s. Joe heard me warming up once and recommended that I check Bunky out as he thought that my approach was on track to being something similar to his. He loaned me Bunky’s record Places We’ve Never Been (Vanguard) which totally knocked me out!” Mahanthappa sought Green out and sent him a tape of his playing to which Green responded by providing some encouraging feedback, leading to a long friendship. Still, the two never got a chance to play together until 2008 during a jam session at the Jazz Baltica Festival. Inspired by that performance, Mahanthappa featured Green in his appearance at the 2009 Made In Chicago Festival. Soon thereafter, Rudresh made plans to record with Bunky, enlisting his regular bassist François Moutin and the dynamic young drummer Damion Reid. Jason Moran, who had played on Green’s CD Another Place (Label Bleu), also quickly signed on. The lineup was set when Mahanthappa told Jack DeJohnette in whose band Rudresh plays about the recording. DeJohnette, who had been a huge fan of Bunky’s from back when he was a young drummer coming up in Chicago, also clamored to play on the session. One can immediately see why Mahanthappa was drawn to Green’s playing: The two share a similar biting tone, harmonic sophistication, a well-articulated rapid fire attack, and a certain rhythmic elasticity. Perhaps whats most amazing about Green is that such modern playing is coming from a 75 year old. The album features originals by both Mahanthappa and Green specifically created for this collaboration. The compositions highlight a collective vision of using traditional forms as a launching point for contemporary improvisation and interaction at its highest level. On Apex, Bunky Green and Rudresh Mahanthappa look back over the last fifty years of jazz saxophone playing and together chart its course into the future.